Transcutaneous electrical nerve stimulation or TENS is a treatment for back pain using low voltage electric current to relieve pain. This is usually done with a TENS unit which is a small battery operated unit with electrodes that pass an electric current from the TENS device to the skin resulting in relieving pain. These products are now available at the online store of Independent Living Specialists Australia wide and subject to a customer’s health cover, they may be entitled to receive a 100% rebate from their health fund. The most important benefit is that it lacks side effects. Unlike oral painkillers which are known to have side effects such as gastritis etc, the TENS device is very safe without any side effects as it is applied externally and with proper treatment, the pain could be eliminated permanently. This is a normal TENS product with adjustable pulse width, pulse rate, intensity, modes and an accurate timer of 15, 30 and 60 minutes with output stopped at the pre-set time. The device includes TENS stimulator unit, carrying case, 2X TENS leads, 9V battery, operating manual and a packet of four electrodes and a belt clip. Its parameters are fully adjustable and give relief to acute or chronic pains such as back pain, sports injury, general muscle pain etc. The battery-powered electrical unit delivers electrical pulses to the nerve fibres relieving pain through the electrodes. This is also a usual TENS device with adjustable pulse width, intensity, pulse rate, modes and an accurate timer of 15,30, and 60 minutes with output stopped at pre-set time. The device includes TENS stimulator unit, carrying case, 2X TENS leads, 9V battery, operating manual and a packet of four electrodes and a belt clip. Its parameters are also fully adjustable and give relief to acute or chronic pains such as back pain, sports injury, general muscle pain etc. The battery-powered electrical unit delivers electrical pulses to the nerve fibres relieving pain through the electrodes. This device is able to store your treatment times and schedules for examination by your therapist later. This device is inclusive of TENS stimulator unit, hard carrying case, 2X TENS leads, 9V battery, operating manual and a packet of 4 electrodes and belt clip. It is backed with 3-year warranty and free replacement without any query. Independent Living Specialists is currently offering 50% off the special pricing already applied on premium TENs machine for a limited period only. This is the ideal time to purchase a digital TENS device which is a great saving. This unit is the usual battery powered TENS machine with comes with a free pack of electrodes. It has an adjustable pulse width, pulse rate, intensity, modes and an accurate timer of 15,30 and 60 minutes with stoppable output at pre-set times. It’s a battery-powered portable unit and easily adjustable with control dials. There are many ways to ease multiple aches and pains and physiotherapy is one such mode that can help a person to lessen the pain instead of increasing the intake of prescribed medicines. Physiotherapy takes care of the physical part of the inflammation, soreness, and stiffness with exercise and massage. It also assists in healing the body by supporting the body to produce natural pain-relieving chemicals. 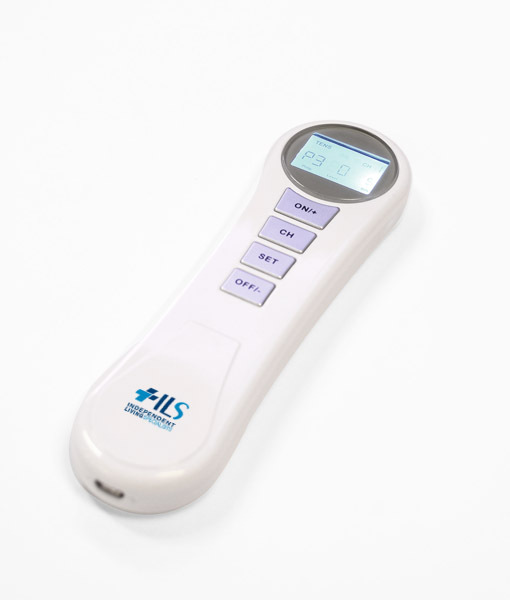 Independent Living Specialists has some unique physiotherapy devices available in all their stores Australia wide. TENS or transcutaneous electrical nerve stimulation therapy is a way to control pain without the intake of drugs. This machine executes millions of tiny electrical impulses to manage the pain. It blocks the pain message from reaching the brain. On placing the TENS pads on the pain area, the electrical impulses race to the brain, dominating the pain impulses resulting in less pain. It improves blood circulation which is the usual reason for various kinds of arthritis, aches, and pains. Although this device helps to reduce the pain level, a certain device might suit your needs better than another depending on where the pain is being felt. This product is currently being sold 50% off the normal pricing for a limited time. It comes in a hard case with 3 years warranty consisting of free replacement without any query. This unit is able to store the treatment times and schedules to be examined by your therapist later. It consists of TENS stimulator unit, carrying case 2X TENS leads, 9V battery, operating manual and a pack of 4 electrodes inclusive of a belt clip. This is a classic TENS machine, consisting of adjustable pulse width, pulse rate, intensity, modes and a precise timer of 15, 30 and 60 minutes that stops output at a preset time. It comes with a TENS stimulator unit, carrying case, 2X TENS leads, 9V battery, operating manual and a pack of 4 electrodes inclusive of a belt clip. This is a popular and fast moving unit. It delivers electrotherapy practicing electrical nerve stimulating pulses to give pain relief which is completely drug-free. It operates wirelessly with a remote control and a 20-minute timer. This is ideal for those suffering from chronic back pain as it is considered an important method of treatment. This device is currently being offered 50% off the special pricing for a limited time only. It is able to stores your treatment times and schedules to be examined by your therapist later. Backed with 5 years unlimited warranty, it consists of a TENS stimulator unit, carrying case, 2X TENs leads, 3XAAA batteries, operating manual and pack of 4 electrodes inclusive of a belt clip. This device comes with a free pack of electrodes. Powered with normal battery with adjustable pulse wide, pulse rate, intensity, modes and a precise timer of 15, 30 and 60 minutes capable of stop output at a preset time. It is a portable battery powered device easily adjustable with control dials. Tens’ top quality electrodes come in 5, 10 and 20 packs. The self-adhesive, fabric backed carbon-based electrodes are designed for even distribution over the electrode surface. It is suitable to be used as TENs pad replacement on all machines. It is reusable and provides the best grip and application to the skin surface. The flexible operation allows the electrode to stick comfortably to the skin surface when the current is dispersed evenly to the area that needs treatment. The Independent Living Specialists are a popular supplier of home care equipment. They are well known for their amazing customer service and after sales support. As a service provided in the aged and home care equipment industry, they always want to provide their customers the very best of products. This is why you always come across NEW PRODUCTS. Though they are new they are also high-quality equipment. All of those products are factory-made by the best manufacturers. If you are interested in purchasing the best home care equipment you can always visit the Independent Living Specialists’ website. Right now the following products are in the top five positions. A lift chair provides elders great comfort. It helps them to get from a sitting position to a standing position, with no difficulties. The Topform Luxor Optima Lift chair is one such great lift chair. This chair offers real comfort to the user with several foam cushions. You can select the chair in three sizes according to your need. Right now there is even an offer that provides free sheepskin along with the purchase. The Standard Comfort Bed Daily Chair has a memory foam cushion finish. This means the user will be comfortable from head to toe. You can also adjust this chair to different positions according to your needs. You can transport this chair wherever you want to. It is quite easy to control and easier to clean when on the go. Predator 4-Wheel Drive Mobility Scooter is one of the most popular products for SALE AT ILS. The four wheels are supported by motors that allow you to travel on any terrain. This is one of the best mobility scooters in the industry. This means it is one of the best walking aids you can ever have. You can even control this mobility scooter using a mobile application. The Envoy 4 Plus Mobility Scooter is an efficient mobility solution for the elderly and disabled. This can also travel on any terrain. Since its batteries last for a long time you do not have to worry about charging them often. This comfortable mobility scooter can accomplish your needs to the fullest. For anyone who needs electrotherapy Portens TENS machine is a great help. You can get immediate pain relief from the electrotherapy this device offers. Since you can discreetly wear this on your body, you can carry on your work without worrying about pain. All of these products are available at the Independent Living Specialists’ website. You can easily use ZIP MONEY to purchase any product over $2500. ZIP MONEY is an interest-free loan with a six-month payment plan and will help you purchase the right healthcare device you need. A transcutaneous electrical nerve stimulation machine or a TENS machine is quite popular. It is popular because it provides a much-needed relief for pain. You can use this state of the art machine and receive pain relief to a targeted area of the body. The Protens & EMS Machine Dual unit is well-accepted and loved by many users and those looking for a TENS machine, are often recommended to try the unit. If you are looking for some quality electrotherapy, selecting this is the best choice. This Protens EMS TENS machine is made using the latest technology. It takes into account the ability to “use it with ease”. That is why the machine is not bulky and cumbersome. Even with the batteries it only weights 60g. The machine also takes into account the ease of wearing it. For example, you could be having discomfort or pain, when you are heading out for an important meeting. You cannot cancel the meeting. At such a moment this machine offers you the chance to wear it discreetly. No one will know you are wearing it. So, you get to work and get your pain relief at the same time. It also offers you the chance to get about 150 treatments with the same batteries. That means you do not have to worry about the cost of using it. It also comes with a remote control which makes it easier to use. You can easily take it wherever you go too. The Protens EMS TENS machine is approved by the TGA. At the same time, it is a product sold by the ILS or Independent Living Specialists. Independent Living Specialists has always provided the best of healthcare and home care equipment, keeping valuable consumers in mind. Therefore, you do not have to worry about using this machine. It is completely safe. As long as you follow the instructions given you will have a good experience with it. The TENS electrotherapy practices electrical nerve stimulating pulses to deliver non-offensive, pain relief which is completely drug-free. It is also a wireless device with a remote control and a 20-minute timer. With new wireless technology, the Protens EMS unit can help lessen complications with use and help assist with pain relief, with zero effort. If you are looking for the best electrotherapy machine Protens EMS is the one. It comes with some amazing features. Since it is TGA approved there is no problem with the reliability. Buying the machine is not a problem too. You have to simply visit the Independent Living Specialists website and make an order. Once you have bought the machine you can easily use it to relieve pain. Just make sure to follow the instructions.